Herbert Harry Smith (known as Bert) was born in Headington Quarry in 1899, the son of Herbert Henry Smith (born in Headington in 1863/4) and Ada Kate Horwood (born in Headington Quarry in 1870). Clarice Smith (born in Headington in 1911 and baptised privately by All Saints’ Church on 26 May 1912). Herbert’s father was a Leading Seaman at the time of his marriage, and was probably away at sea at the time of the 1891 census, when his wife Ada (21) was living at the Pits in Headington Quarry with her sister, Kate Horwood (16), and working as a laundress. He seems to have left the navy shortly afterwards, as at the time of his first child’s baptism in 1892 he is described as a labourer. The family appear to have gone to and fro between Oxford and London in the early years of their marriage. They were possibly in Acton in 1894 but back in Headington by October that year; and in Chiswick at the beginning of 1897 and back in Headington by the time Bert was born in 1899. By the time of the 1901 census Bert’s parents were in London again, living at 7 Church Path in Acton with Emily (8), Beatrice (6), Joseph (4), and Bert (2). His father was working as a foreman labourer, and also living in the same house with his family was another Headington labourer, Robert Goodgame. By 1908 the family was back in Headington for good, and the 1911 census shows them living at Titup in Headington Quarry. Herbert’s father was now working as a self-employed sewers navvy, and his mother was again working as a laundress. Four children were at home: Joseph (14), Bert (12), J (only the initial of this son is given in the census) (9), and Ada (3); and although their cottage only had three rooms (including the kitchen), they managed to squeeze in a boarder. Herbert’s older sisters were both in service down in Oxford: Emily (20) at 29 Stanley Road, and Beatrice (17) at 185 Iffley Road. In about 1912 Bert’s parents moved to Providence Cottage, Bateman Street (then East Street) in New Headington, now part of the parish of All Saints. By 1916 Bert (16) was working as a town labourer. 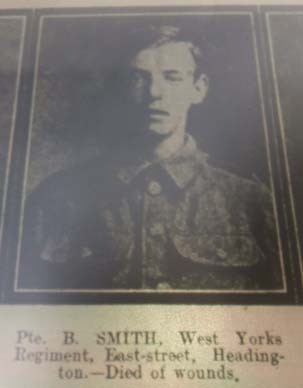 In the First World War Herbert Harry Smith voluntarily enlisted in Birmingham on 17 July 1915, adding three years to his age and stating that he was 19 years and 10 days old. 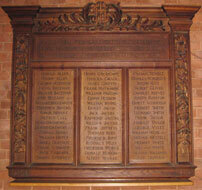 (Men had to be 18 to enlist, and 19 to be sent abroad). He served as a Private in the 1st/6th Battalion of the West Yorkshire Regiment (Prince of Wales’s Own) (Service No. 54194). He died of wounds in France at the age of 19 on 15 October 1918. Herbert Henry Smith remained at Providence Cottage in Bateman Street after the war, but was living at 58 Argyle Street off the Iffley Road in Oxford in 1928, when he died at the age of 65. He was buried in Headington Cemetery on 17 April 1928. Beatrice Kate Smith (born 1894) married Reginald Long in the Headington registration district in the third quarter of 1913. Clarice Smith (born 1911) may be the Clarice Smith who married Charles S. Knights in Oxford in 1939.